The daredevil skydiver Felix Baumgartner not only powered his way into the record books when he jumped to the Earth from a height of 24 miles in 2012. He also heralded a new era in advertising pioneered by the company whose name was emblazoned on his space suit - Red Bull. Why was what became known as the Red Bull Stratos of October 2012 such a ground-breaking piece of TV advertising for Red Bull? Because, according to one commentator: "The commercial didn’t interrupt the event, it WAS the event." In making his freefall jump from a helium balloon, reaching a top speed of almost 844 mph, the Austrian became the first human to break the sound barrier without engine power. He also attracted PR for for Red Bull, which has built its brand around its association with extreme sports, in a previously undreamed of way. Almost 80 TV stations in 50 countries carried the event while a live webcast attracted 52 million views, making it the most-watched live stream in history. Statos is also credited with having raised Red Bull’s profile in core markets such as Western Europe and the US as well as newer ones in Brazil, Japan, India and South Korea. In the six months that followed the stunt US sales rose seven per cent to $1.6 billion. It was a remarkable coup for Dietrich Mateschitz, a former toothpaste salesman who gave up his job to spend a year working out a marketing strategy that involved the creation of a completely new energy drink category. 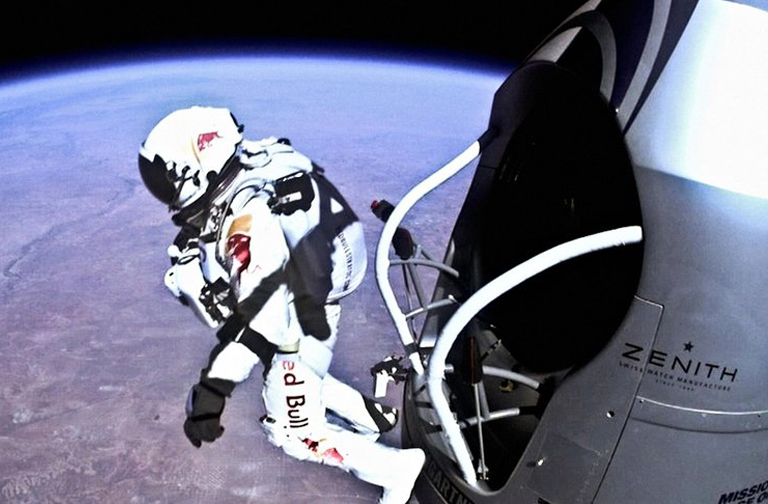 However, Mateschitz and Baumgartner reportedly fell out over the latter’s failure to mention Red Bull before he jumped. He was supposed to have said: "This the is world of Red Bull" but instead declared: "I’m going home now". The pair are said not to have spoken since. Famous as the brand that "gives you wings", the caffeine and sugar-packed alternative to coffee sells around 4.5 billion cans a year. Red Bull sponsors football teams in Leipzig, New York and Salzburg as well as an F1 racing team. Baumgartner’s altitude record was beaten by Alan Eustace, a Google senior-vice president, in October 2014. Eustace said he declined assistance from Google for fear that what he was doing would be turned into a marketing stunt.